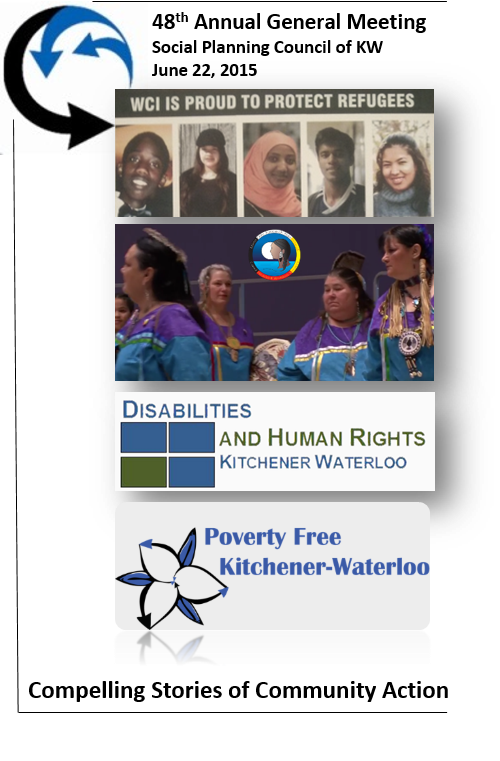 Join us to hear compelling stories of community action on June 22, 2015 during the 48th Annual General Meeting of the Social Planning Council of Kitchener-Waterloo. Continue the Decent Lives discussion to weave what is being done in the community into a deeper understanding of why community action and planning is important to our local landscape. How does community action contribute to decent lives for people living in our community? What can support this good work in our community, generally, and more specifically in our neigebourhoods? Please tell us if any adaptation or accommodation is needed to support your participation. 2015 Membership still being accepted! The Good Hearted Women Singers are an Indigenous and non-Indigenous women’s drum circle. Founded by Community Elder Jean Becker in 2003, the group reflects a sweetgrass teaching. One blade of sweetgrass by itself is not very strong. It can break easily. When several blades of sweetgrass are braided together, the sweetgrass is strong and cannot easily be broken. Through Bridging Communities through Song, the group is building bridges through song with many groups and community, including the Waterloo Regional Police Male Chorus and various local Christian church communities. Students and recent grads from Waterloo Collegiate Institute have been working in partnership with the Mennonite Coalition for Refugee Support to support refugee claimant youth in the Waterloo region. Youth gain the confidence and leadership skills necessary to advocate for themselves while working towards more inclusive environments at schools and in organizations. The group's model of inclusion illustrates tangibly how to break down barriers and build community. 1. A forum for educating, raising awareness and discussing issues related to human rights and disabilities. 2. A starting place for ideas related to advocacy, system change, and pilot projects. 3. An advocate for inclusion and equality for persons with disabilities. 4. A training ground for self and community advocacy. 5. A space to build relationships.